Find hotel near Estancia Mimosa Ecoturism ..
Booking a tour in advance is mandatory. Abaetecotur Agencia de Turismo, Jubaia Agencia, Bonito Way Turismo e Eventos and Agencia Remanso are some of the tour operators in Bonito. How popular is Estancia Mimosa Ecoturismo? I went with my girlfriend to these waterfalls not expecting much, but we both loved it, we did a bit of trecking, swimming on 8 waterfalls, and even had one of them with a jump of 5 meters height, amazing nature view while walking, then we arrived to the main entrance where the offices are, and we had a great lunch. The only thing that wasn't included in the ticket was the water boots to step on the falls as some of them are shallow and with some sharp rocks, but the overall was amazing as it was never over crowded and we were only a group of 8 people to enjoy the whole fall for us only, and every group would respect their turn to enter. The trail was awesome, and they have many waterfalls on the way!! Amazing place to walk and have a close contact with nature. 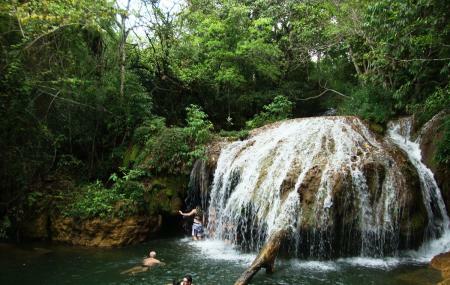 There are more than six waterfalls suitable for swimming. A tour guided by professionals with knowledge of botanic, geology, geography and zoology. There are many guides with fair good skills in English and Spanish, if is the case inform yourself prior to the visit to Bonito. Had such a good day! Well worth the money. The waterfalls are beautiful, you get to swim right under them!The lunch was next-level amazing. The horse ride is worth the extra money, it’s a long and beautiful scenic ride.